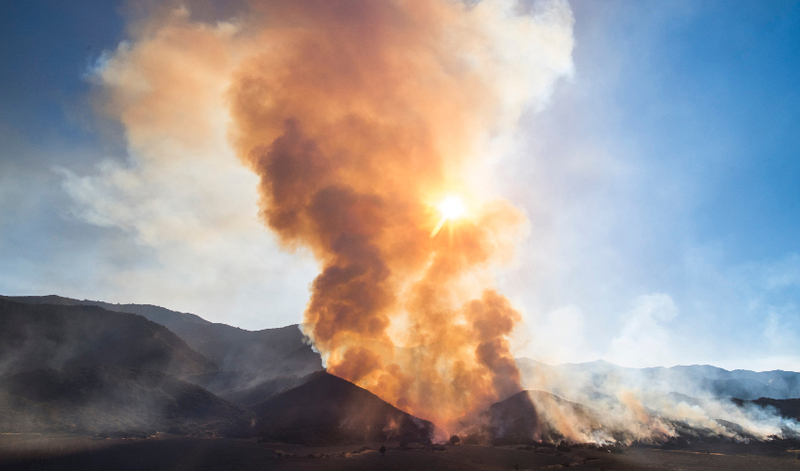 The 2017 Thomas Fire burns in Ventura, California. Forest Service photo by Stuart Palley (CC BY 2.0). When wildfires swept through Northern California last October, humans weren’t the only ones affected. San Francisco State University biologists are now surveying the fires’ impact on the natural world, too, looking for insights into basic biology and lessons for how to manage our precious natural resources in the wake of a disaster. “The fires were devastating, but they provided this opportunity for study — and maybe a way to pull something positive out of them,” said Molly Hayes, a biology graduate student at SF State. Hayes has been surveying bee populations in eight Napa and Sonoma county sites, half of which burned last year. Her advisor, Professor of Biology Gretchen Lebuhn, studied the same sites 15 years ago, providing the perfect baseline for comparison. Comparing the before-and-after may lead to insights for those responsible for managing post-fire landscapes, possibly identifying which seeds to plant to encourage the growth of healthy ecosystems with a full complement of important pollinators, for instance. A Petaluma resident herself, Hayes spent days worrying about a possible evacuation last October. She says that experience was part of what motivated her to study the wildfires. “Even though I wasn’t personally affected, having this huge event right in my backyard made me a lot more interested in how fire affects ecosystems,” Hayes said. Some of Assistant Professor of Biology Andrea Swei’s field research sites were also endangered by the fires. Swei uses long-term study sites in parks throughout the Bay Area to study the population booms and busts of ticks and their mammal hosts. Last fall she kept her eyes glued to the maps provided by California Department of Forestry and Fire Protection, hoping her sites wouldn’t go up in smoke. None did, but one site came close to burning. For both Swei and Hayes, the fires put a new spin on their research. But for Professor of Biology Tom Parker, it was nothing new. For over 40 years, Parker has been studying plants that are shaped by fire — producing seeds that lie in wait in the soil to sprout in the post-fire landscape, which provides abundant space, light and nutrients for new growth. This summer, Parker is out in field sites in Napa and Ventura counties to see how varieties of manzanita plants with different-sized seeds fared after 2017 wildfires. Large seeds buried in the soil are more likely to survive a blaze, he explains, but their size also makes them a target for rodents. “If you have a bigger seed, you have a bigger chance of establishing, but you have a bigger chance of being eaten. You’re easier to find,” Parker said.